As a Georgia woman was taking a picture of herself in a dressing room, she caught someone spying on her. 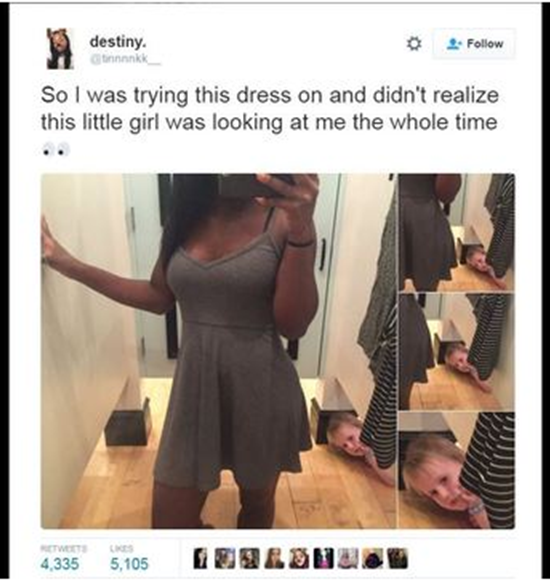 According to Destiny, a Savannah State University student, she was trying on a dress when she saw a little girl looking at her the entire time. The selfie was posted to her Twitter account but was removed from her account a little later. Destiny said the incident took place at Forever 21. There were many people who thought the photo was funny, comparing the little girl to the “Home Alone” character Kevin, portrayed by Macaulay Culkin. However, there were some people who found it a bit disturbing. One user said it could have been a scene from a horror show. The age of the girl is not known. Selfies have been known to go viral. For example, Irish actor Killian Scott was taking selfies with his fans while campaigning for his brother, who was seeking a political office in Ireland. Scott said many people he approached was quite open to his pitch, which is that he knew nothing about politics but his brother was running for office. He told people he’d like for them to vote for him, but if they don’t, it was fine too. Scott said it was a very effective pitch. He said many people just wanted a picture with him. Scott said it was funny to take a selfie with others on their doorsteps. He’d often ask if they’d vote for his brother. Scott said campaigning for his brother gave him a glimpse into the kind of work politicians do. He said he was exhausted after campaigning all afternoon and evening. Scott said he has real respect and admiration for the work they do because it is certainly thankless.